I’ve been making baked tofu quite a bit lately. It’s a great sandwich filling, salad topper or easy baby finger food. Here is the latest version – it is great with pasta too, and the baked herbs on top add a tasty crunch. 1) Drain the tofu and then press the tofu by placing it on a plate, placing another plate on top and then weighing the top plate down with a large can (like 28oz of tomatoes). Tofu should be pressed for about 30 minutes. Or check out this post. 2) Mix all the other ingredients together in a shallow bowl. 3) When the tofu is pressed, slice it into four slabs (cut lengthwise), and mix them up with the marinade. Let the tofu marinade for about 20 minutes, mixing up at least once so that all the tofu slabs are coated. 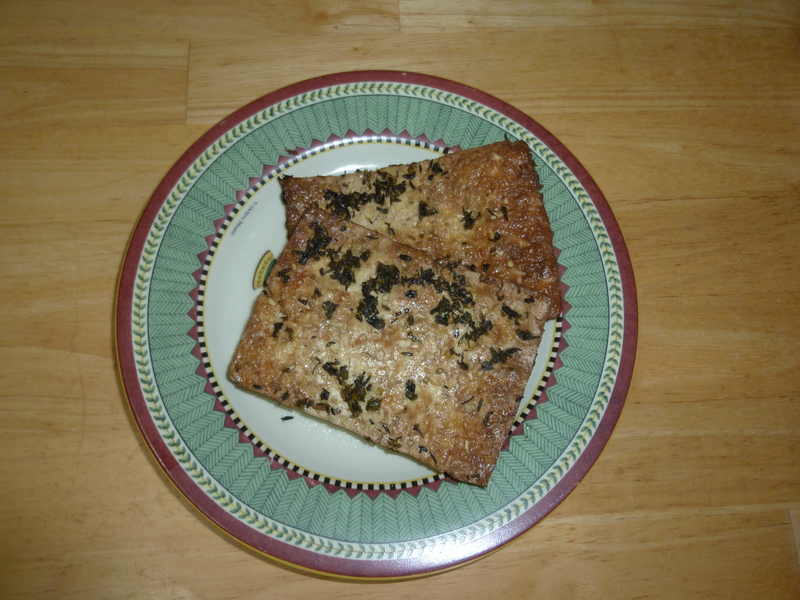 Delicious Italian Baked Tofu. Ready for sandwiches, salads or snacking! This looks tasty! I recently posted an Italian baked tofu dish, I didn’t bake the tofu on its own to make it as savory as yours looks, but it’s still good baked in tomato sauce with veggies and cheese. Thanks for the comment! I’ve become a big fan of baking my own tofu. It’s just so much cheaper than buying baked tofu, and it’s fun to mess with the flavors. It’s also great on sandwiches with extra veggies and peporcinis. Hope you give it a try! This looks great! Due to some recent medical issues I’m supposed to stay away from soy sauce and wine. Do you think balsamic vinegar would be OK? Or some other substitute? And thanks for the advice on how to press the tofu before marinating.. I always have trouble getting anything to stick! Balsamic vinegar would work great! You could also add a bit of salt or extra veggie broth to the mixture if you feel like it is too bland without the soy sauce (since it adds salty-ness) but the vinegar should cover it. If you are looking for gluten-free options there is also gluten-free tamari sauce. Thanks for the question! Let me know how it goes with the balsamic!